What a year we (including our patients) experienced with Coolsculpting. It’s been exactly one year since we purchased our first machine at the Vegas Cosmetic Conference last July. Making the choice to purchase Coolsculpting was a “no-brainer.” You (our patients) were asking for a procedure with little to no-downtime to treat your unwanted fat. We did extensive research before we purchased this machine. We knew before purchasing it that it was the #1 non-invasive fat treatment on the market, had been on the market since 2010, and bottom line: it worked. We have worked hard to build a business and brand for our patients that is trusted. We do NOT choose to carry every single aesthetic option on the market…we only carry the BEST. Needless to say, Coolsculpting has been a perfect fit for our practice. One thing that I love about Coolsculpting as a company is the extensive training that they offer on their product. Having worked in this field for 11 years, I can tell you, not all companies are alike in this. We shut down our office last July for 2 intense days of trainings with a Coolsculpting specialist before we even turned the machine on. Soon after 2 of our staff members flew to Virginia and 2 to California for an intense 3 day 8-10 hour/day training…ALL Coolsculpting. This program is called Coolsculpting University. Every person that completes this program is considered an expert in Coolsculpting. This fall, another 3 staff members will be flying to Coolsculpting University to complete this program. Our philosophy has always been Knowledge is Power! 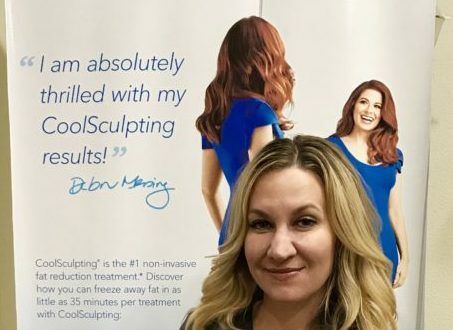 Last December, Allergan reached out to our spa because they were impressed with the volume of clients we had been seeing and our dedication to Coolsculpting. 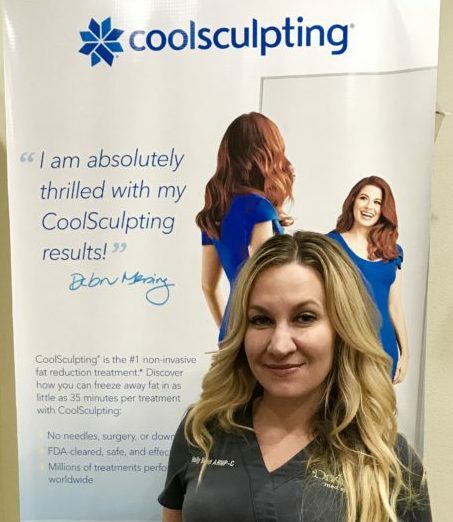 They asked me to be a member of their Medical Advisory Board and to become one of the first of five National Trainers for the National Coolsculpting Training program that they were initiating. It was an honor to be asked and to serve for a company that has the same philosophy of Divinity: Knowledge is Power. I have taken three trips to California (in 4 months), 1 to Virginia, and 1 puddle jumper (wow – little planes give me palpitations!) to Palm Beach since taking the role of Medical Advisory Board Member and Trainer for Coolsculpting. I have trained 6 more Coolsculpting specialists on the machine and have enjoyed sharing our experiences and knowledge with other professionals and offices. It’s a privilege and an honor to train and sit on boards for Allergan but my focus will ALWAYS be to serve the wonderful patients of Spring Hill first. In the last few months, the demands of Coolsculpting have become so great, we recently added a 2nd machine to our practice. The addition of this machine will allow us to DualSculpt – it cuts YOUR treatment time in half. This is fantastic news for you, our patients. We’re proud of what we’ve accomplished in a short amount of time. As the owner of this business, I could never make all of this happen on my own. I’m proud of the dedication and time that our staff puts in every day to continue to learn and provide the best treatments and outcomes possible for our patients.